A lot has been made over the last two weeks about injuries to the unit, but a huge boon for Florida’s offensive line is newly-eligible redshirt junior Max Garcia, a transfer from Maryland who sat out the entire 2012 season and has accepted a position switch from tackle to guard. Garcia was listed as the starting left guard on the Gators’ initial spring practice depth chart and has received nothing but positive views thus far in camp. Garcia, who missed a few days of practice with a sore back, explained last week that Florida’s depth concerns on the offensive line are legitimate but the players are doing whatever they can to make it work. “This spring is tough with the numbers that we have. The coaches are telling us we’ve been doing a great job, but at the end of the day, it’s going out there and doing what we need to do. With the O-line, we’re the backbone of the team, so we just got to keep pushing forward and getting the job done,” he said. Garcia also spoke about why he decided to transfer to the Gators, noting that he is sure he made the right decision. “I’ve had a lot of support with the coaches and the players. That’s the main reason why I came down here, just because of the players that were here, the players I interacted with on my official visit. We got a good O-line, great chemistry, so the transition has been going really well,” he said. Though he is now fully in the mix, Garcia had to sit out the entire 2012 season, watching the team from afar as it completed an unexpected turnaround under head coach Will Muschamp. He discuss how that affected him as a competitor. After years of hoping to develop a 1,000-yard rusher, the Gators finally found their man in 2012 in Mike Gillislee. And then he graduated. Unlike seasons past, Florida appears prepared at the position with three players ready to contribute for 2013. Leading the pack is sophomore running back Matt Jones, a player who took a while to get going last season but ended the 2012 campaign with 19 carries for 162 yards (8.5 yards per carry) and two touchdowns in UF’s last three games. Everything about Jones coming out of spring practice has been positive. Muschamp even said Tuesday that he has somewhat separated himself from the pack. Jones’ ability to run the ball with great aggression – combined with his ability to protect the quarterback and his proficiencies caching the ball in the passing game – have helped him stand out in front of redshirt junior Mack Brown and freshman Kelvin Taylor. While Jones has stepped up at the position, Brown is far from giving up hope that he can win the starting job. Leaning patience, persistence and hard-work from watching Gillislee for the last few years, Brown believes that he is in the perfect position to finally come through and contribute for the Gators. When now-redshirt junior Gideon Ajagbe committed to play for the Gators, he assumed that his days of playing offense were over. A running back and linebacker in high school, Ajagbe joined the Florida football program to play the latter position but barely got on the field early in his career as a combination of injuries and talent forced him to the back of the line. A religious man, Ajagbe gives credit to his faith for putting him in the position – as well as Muschamp for giving him the opportunity – to compete at a brand new position. 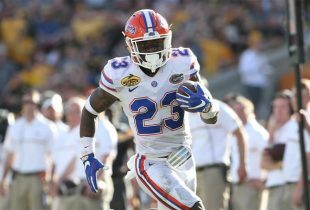 Though Ajagbe has never played fullback before, the Gators were in desperate need of a backup for junior Hunter Joyer and both he and redshirt freshman Rhaheim Ledbetter are in the process of trying out for the position this spring. Now going up against the linebackers that used to be in his position group – “It’s fun. There’s like no pressure. I’m not like afraid of them. I love them, they’re my boys.” – Ajagbe is enjoying his time at fullback but knows he has a long journey ahead of him in order to make the position his own. “I have a lot to learn but I’m happy with Coach White. Coach White has really helped me out, helped me convert and learn how to play the position. I’m still learning a lot. There’s a long of things. I have a long way to go. There’s the whole summer,” he explained. Ajagbe has drawn nothing but rave reviews from the coaching staff and his teammates thus far and appears to be close to solidifying his spot behind Joyer at fullback. Sophomore wide receiver Raphael Andrades knew it would be difficult to fit playing for the baseball team in with spring football practice but has been dead-set on doing just that from the day he stepped on campus. With approval from both coaches, Andrades joined the baseball team after the football season and is now faced with the tough task of fitting in football practice around baseball practice, games and away trips. “Coach Muschamp didn’t have a problem with it as long as I did what I had to do in football, and Coach [Kevin O’Sullivan] didn’t mind either,” he explained. Being away from football for so long put Andrades a bit behind the eight-ball when he returned to practice, especially considering there is a new wide receivers coach Joker Phillips, in the fold. “I’m getting better. I’m learning about the play concepts more and learning what I need to do in order to play. I have to understand what I need to do and the objective of the play,” Andrades agreed. Man, that’s good stuff. Can’t wait for football season to start for real. GO GATORS!! !